Welcome to December's Fish Friday Foodies! Would you like to join us? We post and share new seafood/fish recipes on the third Friday of the month. To join our group please email Wendy at wendyklik1517@gmail.com. Visit our Facebook page and Pinterest page for more wonderful fish and seafood recipe ideas. Today it's all about Seafood Recipes for Entertaining hosted by Sue at Palatable Pastime - and I have had my eye on a few different shrimp with bacon appetizer variations for awhile now and decided that would be quick, easy, and delicious to whip up! I mean... shrimp, and bacon! This version takes very little prep time, and you have a little sweetened, juicy, appetizer to share in a jiffy! 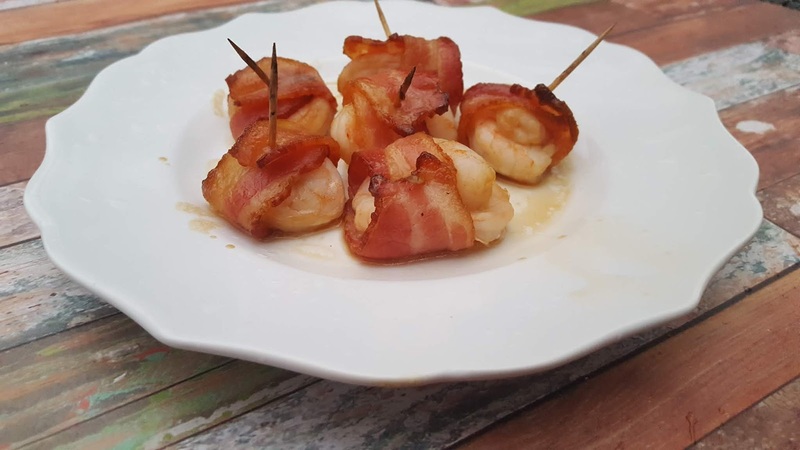 The most important step is making sure your bacon is nearly cooked during the initial phase, so that your shrimp doesn't get overcooked once you've added it and placed the bundles into the oven. Cooking times will vary depending on your oven, this is one of those recipes you kind of have to go with your gut on. I hope you find something delicious in the round up below to serve or bring at your upcoming Holiday gatherings! Preheat oven to 400 degrees and line a baking sheet with foil, place a wire baking rack over the foil. Place toothpicks (1 per half-piece of bacon) in water to soak so they don't char / burn in the oven. Cut bacon in half and par-cook in the oven about 10 minutes. The fat should be rendered, and it should begin to look cooked, without crisping yet. Meanwhile, prepare the glaze by blending the Southern Comfort with the brown sugar in a small bowl; stir until well combined. Place the shrimp in a medium sized bowl and pour all but about 2 Tablespoons of the glaze over the shrimp. Stir gently to coat. 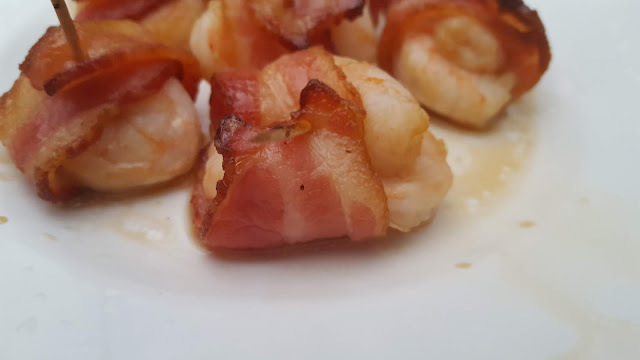 When bacon is ready, lay 2-3 medium shrimp on each piece, in the middle, and pull the sides of the bacon up and around it. Secure with a toothpick inserted through both ends of the bacon and through the shrimp. When all bundles are prepared, use the marinade from the bowl you were soaking the shrimp in to glaze all before returning to the oven for 5-7 minutes. 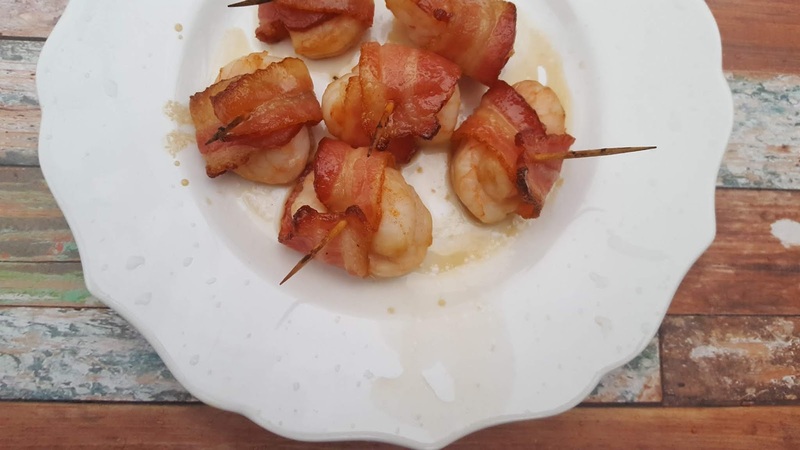 Bacon should be completely cooked and lightly crisped, and shrimp cooked through. Remove from oven and use a clean brush and reserved marinade to brush shrimp again after placing on a serving platter. Sprinkle with a small amount of black pepper and serve. Shrimp and bacon....YUM. I love getting Woo Dip Har at Chinese Restaurants. I'm going to have to look that one up! I've never heard of it! These sound so easy and delicious, and everyone loves bacon. These will make an appearance New Year's Eve at my house for sure! Bacon always seems to work well with seafood - love how easy these are! Great combo of bacon and shrimps. Perfect for a party!